Letters of recommendation should be sent directly from your two (2) references. Applicants must be a U.S. citizen or permanent resident of the United States. Be and remain an undergraduate student in good standing. Plan to complete an undergraduate degree program on or after December 2019. Students selected to participate in the program will receive housing, a meal plan and a stipend of $5000 for the summer. The program will also contribute towards their travel. 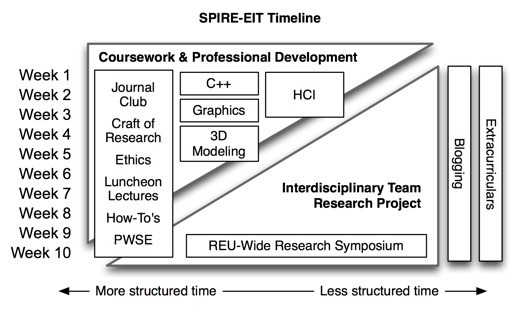 Learn how to run a successful REU program for your institution! The following site was developed from the 2017 NSF CISE REU New PI’s meeting and serves as a guide to orient and direct new REU sites.